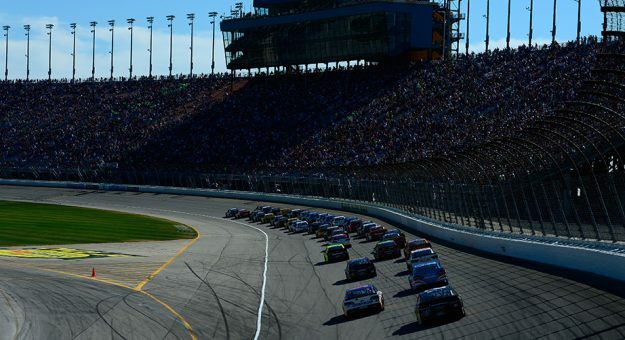 JOLIET, Ill. — Chicagoland Speedway announced today its 2018 Monster Energy NASCAR Cup Series race will take place Sunday, July 1, moving back to its longstanding, fan-favorite summer date and kicking off NBC’s live race coverage of the season. Since its inception in July 2001, Chicagoland Speedway, hosted its NASCAR weekend during the month of July through 2010, before moving to September. The world’s greatest stock car drivers will converge on the Magnificent Mile and a Half to the backdrop of fireworks, camping, tailgating and music as fans will enjoy four action-packed races: ARCA Racing Series, NASCAR Camping World Trucks Series, NASCAR XFINITY Series and Monster Energy NASCAR Cup Series. For more information about Chicagoland Speedway, follow us on Facebook along with Twitter and Instagram @chicagolndspdwy. Chicagoland Speedway is a 1.5-mile, paved oval race track located in Joliet, Ill. The track has hosted racing events of the major U.S. racing series, and currently conducts races in all three NASCAR national series, including the NASCAR Camping World Truck Series, the NASCAR XFINITY Series, and the Monster Energy NASCAR Cup Series. Along with Route 66 Raceway, a multimillion-dollar complex that includes a ¼-mile stadium-style drag strip and a ½-mile dirt oval track, Chicagoland Speedway is wholly-owned by International Speedway Corporation (ISC), a major promoter of motorsports activities. ISC owns and/or operates 13 of the nation’s major racing venues, including Daytona International Speedway. For more information on Chicagoland Speedway, visit ChicagolandSpeedway.com.